In the 90s, R&B groups came a dime a dozen. Many of those groups made classic albums. Many of them had chart-topping hits. Many have even sold millions of records and toured worldwide; but few have stood the test of time. When you think about all the groups that have come and gone over the years, there's one that has stayed together, never broken up and still have a career to speak of in 2015. That one group is none of than Jagged Edge. The legendary R&B group recently returned with a brand new album, JE Heartbreak II. With the help of long-time collaborators, Jermaine Dupri and Bryan Michael Cox, this soulful album filled with that JE's signature sound. With their 8th studio album, Jagged Edge were able to solidify their position in history as one of the last bands standing from 90s R&B music. 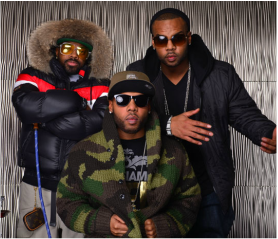 Over the Thanksgiving holiday, The Urban Advocate got a chance to chop it up with Brian Casey, one of the twins and lead singers of Jagged Edge. Check out the interview as we discussed everything from the new album and working with Jermaine Dupri to what separates Jagged Edge from the rest of the R&B groups on the market. We even got the chance to have a little bit of guy talk.